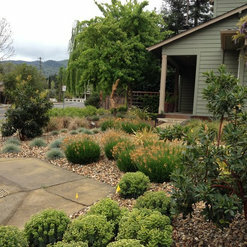 CLCA, Irrigation Association, Bay Friendly Coalition, Napa Chamber of Commerce, Awards from CLCA: Best Landscape Maintenance Entry for a large residence Statewide. First place for medium residence in 2013. Awards of recognition for landscape maintenance 2004, 2011, and 2012. 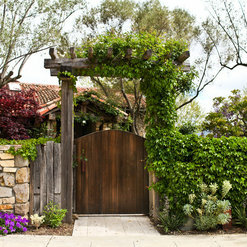 20 Projects for Lou Penning Landscapes Inc.
12 Reviews for Lou Penning Landscapes Inc. I am totally happy with all aspects of Lou Penning landscapes. 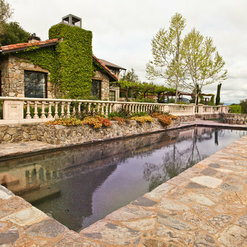 They came up with an exceptional plan for the landscape and were very Professional with their work and follow through. They showed up on time and stayed in constant communication with us. They also supervised their sub contractors and made sure their work was finished to perfection. Ben and Luke are a great team and I would recommend them to my friends and co workers. I work for Coldwell Bankers Brokers Of The Valley and I have placed them on our Vendors List for our Clients. The fires wiped out my entire landscaping/drainage/irrigation in my front and back yard. This was a big job. Ben and Luke worked with my budget and time frame. They were able to develop a beautiful plan including a 3 ring binder with instructions on maintenance of my new yard. Some plants had issues and were replaced quickly. The crew were so considerate of my dog roaming the property and were very helpful. I would highly recommend working with Lou Penning Landscapes. (Re)landscaping our property was quite honestly not on our list of priorities. But most of it burned during the wine country wildfire in Oct 2017. Thankfully our house was spared, but our outbuilding and property were pretty devastated. Before we could focus on landscaping, we had to take care of our well water situation, rebuild our outbuilding and take care of some other infrastructure issues. Needless to say, this was a pretty stressful time, and we were also constrained somewhat with our insurance policy limits. I talked with several landscape design and installation firms. 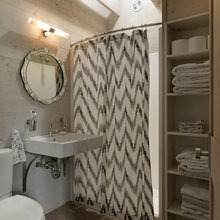 I initially sought out Lou Penning because of recommendations on Houzz. I'm really glad we chose Penning. Ben Penning is so easy to work with - he understood our concerns, priorities, and budget constraints. At the time we met with Ben, we had a lot of burned trees, shrubs, and melted irrigation. We had done some cleanup but it was hard to know what they were really working with. On top of that, we live in an area with a lot of volcanic rock, so it's hard to know what you can really plant without moving rocks or jack hammering. All of this to say that budgeting for our project was understandably difficult. Ben was flexible in how we constructed the budget, and I appreciated his flexibility and willingness to work with us. The crew that worked on our property was great -- they work hard, do high quality work, and are meticulous. It's so nice to look outside and see GREEN again! We have a palette of native plants, shrubs, and trees that will blend in well with the area we live in as they grow and mature. We'll continue to work with Ben in the future! We were very pleased with the work that Lou Penning and team did for our home. They were professional, courteous and most importantly know their stuff! We highly recommend Lou Penning Landscapes based on our experience with them over the past year. 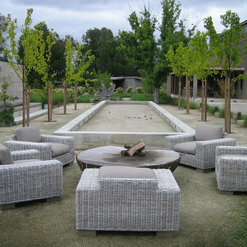 After seeking several contractor bids for our landscaping project in Napa, CA, we hired Penning because their pricing was competitive, they were able to start the project quickly, we liked the quality of their work, and they made the process easy. Everything from the bid process to final execution went smoothly for a large, complicated residential project. We dealt mainly with Ben Penning, who is terrific, although interactions with the rest of the team -- including Luke, Jose, Ben's father Lou, and the subcontractors -- were all very positive as well. Ben was very communicative along the way, managing expectations and keeping us updated on progress. He anticipated "unknowns" in advance -- such as the amount of jackhammering that would be needed based on the rock content of our soil. This meant that the extra cost to dig thru rock, did not come as a surprise.. We found the company to be honorable, responsive, and responsible. 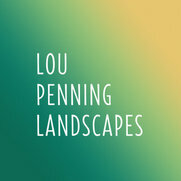 We would highly recommend Lou Penning Landscapes, with no reservations whatsoever. I could not be more pleased with the job that Ben Penning and his crew performed at our home. They worked very long and hard. And it shows. I would be glad to recommend them. 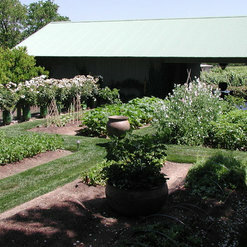 Lou Penning designed my front driveway which was a drive very long country driveway with planted areas on either side. 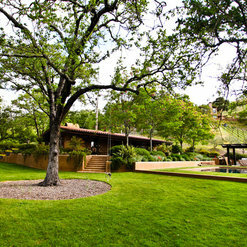 He designed the most beautiful, elegant, low maintenance planting, concrete paths that connected the two buildings that sit on the driveway that we could could ever hope for. 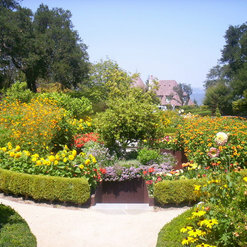 He was thorough, went through plant choices with me, and created a driveway area that is a spectacular garden. His estimate of costs was even under budget. What started out as mud and broken asphalt was transformed into something fantastic. I loved working with this incredibly talented man and would highly recommend him to anyone. Lou Penning and his crew did a total relandscaping of our front and back yards in Alta Heights two years ago. It looks absolutely gorgeous, and has matured into a showpiece that never fails to draw compliments from new visitors. 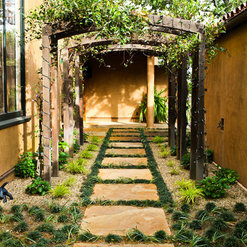 The work included installing drip lines, a fountain, low-key tree lighting, small trees, and three wooden raised beds, along with ground cover, a few boulders, and a wide rage of plants. When adjustments were needed after some plants died, Lou was more than willing to talk it over with us, and to help with the selection of replacement plantings. Communication was key; while Lou had definite ideas about what to plant and where plantings should occur, we took this to be a sign of his expertise, and worked with him to come up with compromises when his ideas differed from ours. We have recommended him to several friends, and will continue to do so. Working with Lou was unfortunately a nightmare. After $7000, to landscape a very small front yard, I have a sprinkler system that is constantly breaking, and a tree that leaves a mess all over my driveway and yard, and plants that have looked terrible in how they have grown in and have needed replaced. Because I was young and inexperienced, I felt that Lou really took advantage. He steamrolled me into doing what he wanted, not what I asked for. He had absolutely no knowledge of plants, and could not tell me what any of the plants would look like or how they would grow. I had to ask repeatedly for details before he reluctantly showed me some photos of similar looking plants. He charged me an arm and a leg for a job that ultimately was poorly done, not what I asked for, and that I have had to spend several hundred dollars ( and will have to spend more) fixing into something that is what I asked for and that is actually workable for the space. This project was done approximately ten years ago and has looked worse, not better, over time. 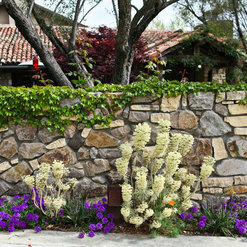 A talented landscape architect is aware of how his or her design will look over time as the plants mature. Unfortunately, as my yard shows, Loo seemed to have no awareness, or concern for this at all. This was quite a surprise since we have not heard any complaints about our service after we did the job in the fall of 2001. That was 15 years ago, so I may not remember all the details, but my family lived across the street and I would have been happy to make any changes or repairs if you had asked. We presented a design that named the plants, irrigation lines and other features. You OK’d the work and signed a contract. I felt that we had a good working relationship and positive exchanges throughout. I am really sorry that you felt it was not what you wanted. Now days with Google it is easier to look up plants, then we had to rely on descriptions and drawings and limited pictures. We communicated with you by writing everything down so that there would be no misunderstanding of what we were going to do. 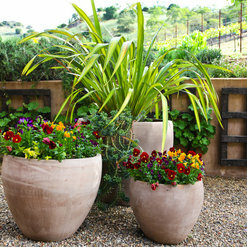 Water systems and plants need regular maintenance. Irrigation systems need to be turned on and inspected and controllers need to be adjusted at least monthly. A little bit of maintenance can save a lot of trouble when the temperatures climb. Low maintenance plants and yards still need regular attention, just less than a lawn with mowing, fertilizing and high water use. I am really sorry that you had a bad experience but it could have been avoided had we received a phone call expressing your concerns earlier in the process. We would have been happy to come over and give a look, adjustment or consultation any time after the installation. Professional team, paying attention to the environment and creating landscape that are in line with the project, water conservative and easy to maintain. Ben Penning from Lou Penning Landscapes oversaw the complete remodel of the gardens and patios and pathways around our pool. 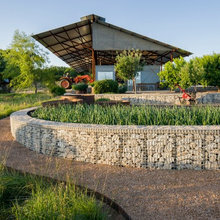 Almost 300 plants and trees were planted, flagstone pathways and patios built, a dry creek bed configured, new irrigations system and lighting installed. The job was done with great professional care and consideration, in a timely manner, and cleanly. Lou Penning Landscapes is continuing to oversee our beautiful new gardens and they are thriving. We couldn't be happier with our results, and would recommend this team wholeheartedly. 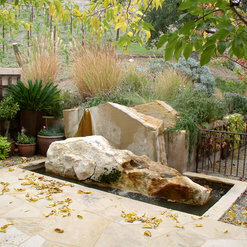 15 Ideabooks for Lou Penning Landscapes Inc. Commented: Can you describe the materials and construction of the chimney?I think it's corten steel that has been distressed with an acid wash. We didn't do the chimney though. Commented: What are the dimensions of this court? 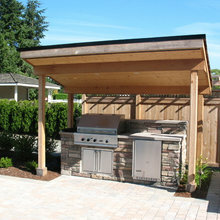 Love the look and Pergola.It's 50' x 10', thanks for the question! 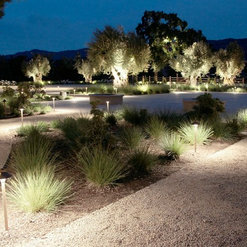 Commented: What lighting did you use on the court edge & is it good for night?This Bocce court was 60'x10' inside dimension.